Sometimes I have to go looking for examples of poor grammar, and sometimes they just land in my lap. The latter happened this week at the hair salon, where I discovered the magazine North End Scene, published by DePasquale Ventures, which owns a number of Italian food outlets. The North End is not an area I know well. But as it's crammed with restaurants, bakeries and an increasing number of hip boutiques, I feel I should get a better sense of its contents. So I started to read. Let's leave aside the fact that the best feature—interviews with Boston hotel concierges—is unrelated to the North End, and skip straight to the good stuff, in order of reverse heinousness. First of all, if you're writing a food article, could you please check brand-name style? It's Ritz crackers (or, according to the Nabisco site, Ritz®). 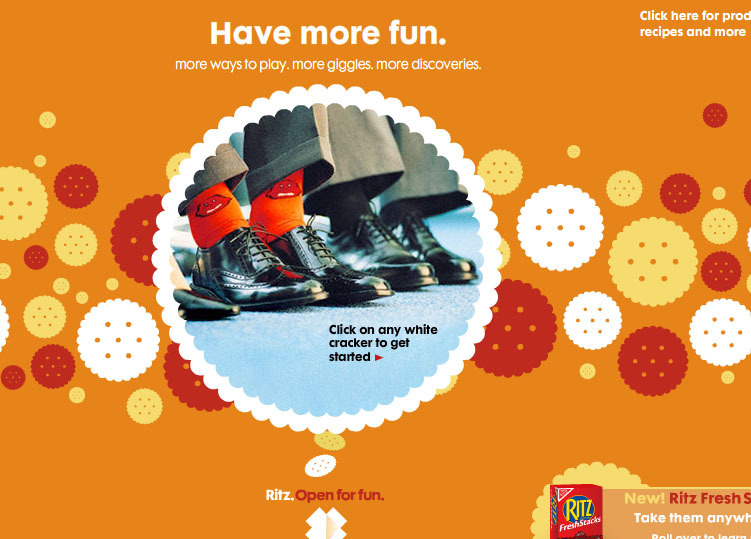 Side note: the current online Ritz campaign has the most awesome wording on its opening page ever. If it's no longer up, don't worry: I saved a screenshot. And what's with the punctuation here? That comma after "extraordinary" should really be a colon. And that's without considering whether the intended (upscale) audience for this mag would view buying a selection of imported cheeses as an "extraordinary" action. Moving on. The next one's pretty long, and needs more space than this narrow layout allows, so please to read it here. Oh, where to begin? The observation that "American women" (all of them, one imagines) "literally have their bank accounts hanging in their closets"? The writer's unchecked disagreement with the opinion of "any 'fashionista'"? 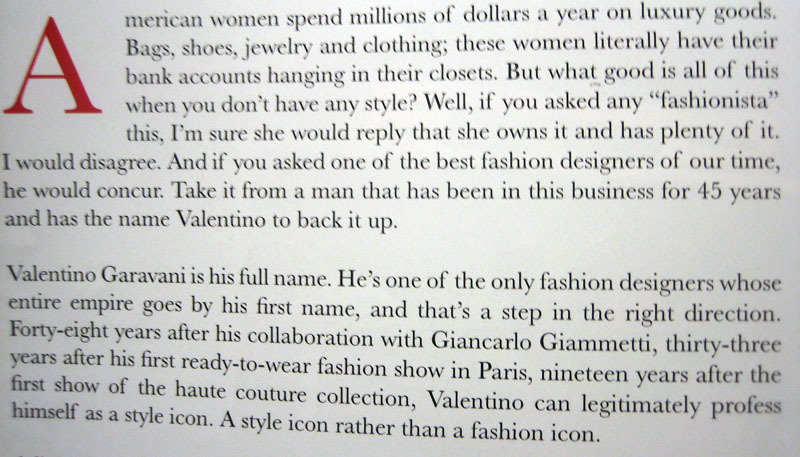 The line describing Valentino's 45-year career, followed by another noting that he's worked in the fashion industry for at least 48 years? Or how about the way this writer re-invents "to profess" as a reflexive verb? Genius! He literally lives in a lifestyle dictated by a fantasy world! And there are no normal people! Why does it not surprise me that Alisa Kapinos, the writer of this article, is also the magazine's editor in chief? But all of this pales into comparison with the simple beauty of one of the most egregious basic errors I have ever seen in print. What? WHAT? "The bow-shaped boat, what used to be the traditional means of transportation ..."
Copyeditor General's ruling: It's perfectly acceptable for a company that owns multiple restaurants to create a glossy magazine whose central goal is to promote those businesses. But as I've said many times before, you can't overlook the details. If you're trying to brand yourself as a model of upscale sophistication, you have to hire people who can write and edit. Or is North End Scene an accurate reflection of the dining experience at Bricco or Umbria: a veneer of style hiding poorly executed dishes? okay, I wasted a lot of time with that Ritz home page. I literally love eating Ritz Crackers on bow-shaped boats on the Grand Canal. The last time I heard WHAT used in that way was a line of dialog from "Guys and Dolls". 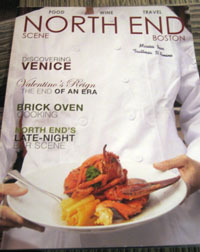 It's a bit disconcerting coming from a publication about the North End. Who wrote the Ritz page? I expected to see a clickable picture of Fred Durst. 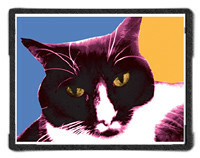 Maybe it's time for Ritz to go Web 2.0 and re-brand as RitzCrackr. They could sell virtual crackers which you could literally eat right off the screen.